It’s kind of funny that although I don’t really pay a lot of attention to religion, I sure spent a whole lot of time inside churches and other religious sites while visiting Armenia. I did this, in part, because Armenia was the first Christian nation on earth, adopting Christianity as its state religion back in 301. 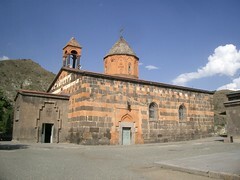 As an outsider, it is difficult to determine how important religion is to the people of Armenia. My perception is colored by the fact that R, the first person I met, attended church services on Sunday morning, something I went to as well, just for the experience. As I write this, I cannot think of a single person I personally know in Germany, the United States, or elsewhere (read: Canada, United Kingdom, Netherlands, or China) who regularly attends church services. In fact, I can only think of one person who goes to church every once in awhile on Sunday, plus two of my siblings who go to Temple on a regular basis. Beyond that nobody I personally know is really religious. 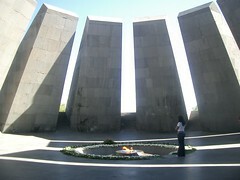 Regardless, religion is at the root of Armenia’s existence—and it is accentuated by the fact that on three out of four sides, it is surrounded by Muslim countries: Iran to the south, Turkey to the west (guilty of genocide directed at 1.5 million Armenians in the early 20th century), and Azerbaijan to the east (war from 1989 through 1994, no active fighting, but hostilities definitely still exist). Only Georgia, to its north, is a Christian nation. Along my journey, I visited three monasteries and at least four churches (that I can recall as I type this). The first church, as I discussed in “Shat Lav,” was dedicated to St. Mashtots, the man who received and distributed the Armenian alphabet. 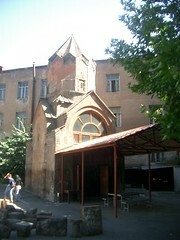 Other churches included two inside Yerevan courtyards—both of which were incredibly beautiful, and the last was in Vanadzor, when I visited the Ghara Kilise, or Black Church. Despite my lack of appreciation of religion, I saw no harm in helping these churches survive—the architectural design of these buildings are inarguably magnificent: soaring roofs, beautiful domes, large open inside spaces protected from weather (except in the case of Yerevan’s Katoghike, which is so small that, as Lonely Planet puts it, “the congregation stands in the yard.” I ended up buying candles at most of the churches I visited and, in my own way, lit them for various people I know—so if you win the lottery in the near future, I am probably partially responsible (donations appreciated). However, the true highlights of my Armenian adventures were the three monasteries that I visited, starting off with Vahanavank, a hillside monastery located east of Kapan on the road to Iran. R and I got there by means of a taxi driven by one of the few blond Armenians (most have black hair, although on my last full day in the country I saw two honest-to-god red-heads) that one can find. The monastery is, and I want to make this very clear, not a tourist attraction. Rather it might become one sometime in the future, but for now it is under reconstruction. Perched on a hillside the setting could not have been more idyllic. We were there whilst the workers were taking a break, so it was possible to look around it without having to endure the noise of cranes and stones being dropped. 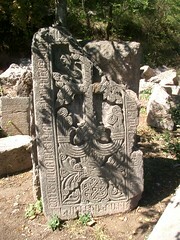 Amazingly my host, R, knew one of the workers, Boris, who is the stone carver. We wandered around the stones and found some old ones that had incredibly intricate carvings, especially when you consider these stones were all carved long before modern technology. I declined the offer to climb on the roof knowing that had I managed to successfully climb up, I would have needed to be carried down. The views of the surrounding countryside from this spot were stunning—the fall colors were just starting to creep into action, and I can only imagine that by now they are in full blast. The next two monasteries I visited are UNESCO World Heritage sites, and why my third stop in Armenia was the little known city of Vanadzor. 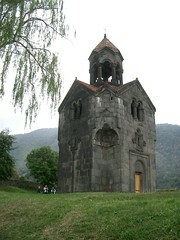 In 1988, Vanadzor, at the time named Kirovakan, suffered severely from the Leninakan Earthquake. Down the Debad River, going toward Georgia, one enters the Debad Canyon, home of the Sanahin Monastery and the Haghpat Monastery. 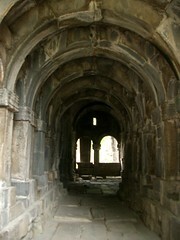 Both of these monasteries are old: Sanahin’s oldest structure was built around 928 and Haghpat around 976. To get to these two monasteries from Vanadzor I took a taxi: four hours round trip in a seatbeltless Lada on narrow pothole filled roads made for a thrilling trip to two of the most beautiful places I’ve ever had the pleasure of visiting. The Sanahin Monastery had grounds that one could just wander—none of the typical gift shop or tourist facilities one might expect to find in the West. I spent quite awhile wandering the grounds and admiring the facilities. The interiors were a bit dark, the floors a bit uneven, and the actual church was locked—although I did peer through the hole in the door—magnificent! I tried to imagine what it would have been like to be a student learning medicine at Sanahin studying in its study halls. After I had my fill of Sanahin, we drove downhill to the Mikoyan Museum, which was, unfortunately closed, but I did get a photograph of an ancient MiG perched on the side of the hill, and then we continued down the canyon to the Haghpat Monastery. Haghpat, like Sanahin, was perched on the side of a hill, with incredible breathtaking views of the country side. On our way up from the bottom, we drove around many switchbacks, and I enjoyed the view of canyon in the distance. Once at the top, we parked and I headed into the grounds—where there were a number of other tourists (later I discovered that the tour bus parked out front had a load of German tourists) taking photos. I wandered the grounds, bought a few candles and lit them in the church and sat to enjoy myself. As I’ve confessed already, I’m not really a religious person, but really, I was awestruck while sitting in the church. It truly was beautiful and amazing. The church’s entrance hall floored me (actually the ceiling is what got my attention). I spent awhile wandering around the grounds admiring the bell tower, investigating the hidden spaces, and looking out at the spectacular views of the valley. It was with a great deal of regret that I returned to my taxi, but not before visiting the lady selling bottled beverages—where I spent a few dram on locally produced specialties. It was a beautiful trip back to Vanadzor, where I had the driver drop me in the middle of town—and my 1,000 dram tip resulted in a bag of plums and a bag of currants.